During the Finals of Wetskills-India 2017, Mr. Kartikeya Sarabhai, director of Centre for Environment Education was appointed as Wetskills’ international ambassador. Machtelijn and Johan welcomed him by giving him the Wetskilda statue made in South Africa. (Interesting to say is that this hand-made statue was produced in Durban, the city where Ghandi lived for several years before returning to India). “It is second time that we have collaborated with Wetskills. I believe the initiative provides an excellent platform for the young. It’s takeaways can also be applied for the Smart Cities initiative of the Government of India” Sarabhai said on the collaboration (source: Times of India). See the movie in Gujarati about the finals of Wetskills-India or go to our website. 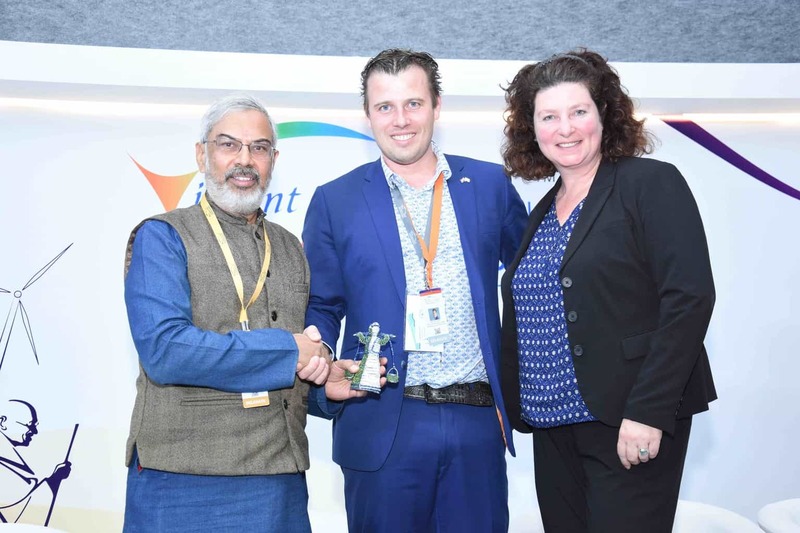 Wetskills Foundation, Center for Environment Education, DuurzaamDoor (RVO.nl) and Gujarat Pollution Control Board have agreed to organise at least two events in upcoming 4 years. Administrated by: Royal Netherlands Water Network (KNW), Koningskade 40, 2596 AA, The Hague, The Netherlands. Wetskills Is An Independent Foundation Based In The Netherlands. Wetskills Is Part Of The Human Capital Agenda Of The Dutch Water Sector. The Royal Netherlands Water Network (KNW) Is The (Financial) Administrator For The Foundation. The Wetskills Water Challenge Is Developed Bottom-Up By Enthusiastic Water Professionals Who Are Closely Involved And Passionate About Their Profession And The World Of Wetskills.